Purpose: The goal of this institutional analysis was to evaluate the role of stereotactic radiosurgery (SRS) in primary and metastatic spi nal and paraspinal sarcomas. Methods: Patients with pathologically confirmed sarcomas who received spine SRS at our institution between June 2001 and December 2013 were retrospectively reviewed in this analysis, which was approved by the institutional review board. Electronic medical records of clinical exams, and computed tomography (CT)/magnetic resonance imaging (MRI) were evaluated. Post-treatment pain control, neurological improvement, and radiographic tumor control were the primary endpoints of this study. Results: A total of 23 patients (78 vertebral bodies, 53 tumors) were included. The average age of the cohort was 57 years. The median surgical dose was 18 Gy in a single fraction (range, 10 to 20) prescribed to the 90% isodose line. Median follow-up time was 14 months. Fourteen patients were deceased, with a median survival of 15.5 months. 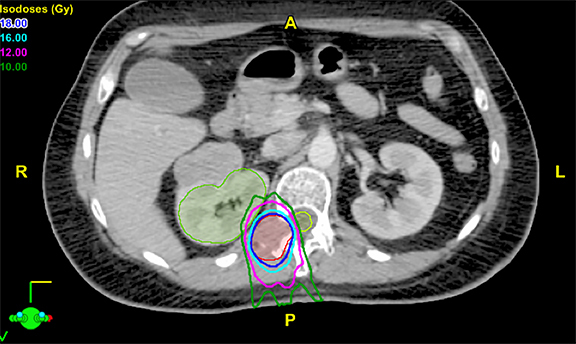 The average tumor volume was 53.12 cc (range: 2.02 to 207.25 cc). Overall pain response was 75% (25% partial and 50% complete relief). Pain was stable in 25% of the patients, and no pain progression was observed. Total neurological response was 67% (0% complete, 67% partial). The remaining 33% of the patients were neurologically stable after treatment. In 1 patient, a new neurological deficit was observed after SRS. Total radiographic response was 67% (0% complete, 29% partial, 38% stable). Local tumor progression was observed in 33% of the patients. One patient initially had a partial radiographic response that progressed after 10 months. Another patient was initially stable but experienced radiographic progression after 3 months. Eight vertebral compression fractures (VCFs) were noted, 2 of which may be attributed to SRS. No other adverse effects were observed. Conclusions: A total of 23 patients and 78 spinal levels were treated with SRS, resulting in fairly good response rates for pain relief, neurologic improvement, and radiographic tumor response (75%, 67%, and 67%, respectively). Our results indicate that SRS has a role in the treatment of primary and metastatic sarcomas of the spine. Unlike the majority of cancers that originate from epithelial tissues, sarcomas are rare tumors that arise from embryonic mesenchymal cells. Due to this origin, sarcomas tend to follow a distinct biologic pattern, causing them to grow radially away from the center.1-5 Managing sarcomas in the spinal and paraspinal region often comes with a difficult choice: using aggressive treatment to achieve optimal local tumor control or a more conservative approach to minimize the risk of severe toxicity. Poor local control (LC) for sarcoma patients correlates with a significant decrease in overall survival (OS).6 Thus, it is crucial to find the appropriate balance between LC and toxicities for these patients to achieve the best possible outcomes. Complete surgical resection, the favored method of achieving LC for most spine sarcomas,6-11 is effective but difficult to accomplish without harming the spinal cord and other intricate tissues such as the surrounding muscles, tendons, nerves and bone. Resection of these tissues often necessitates extensive reconstruction and complex stabilization, which can result in functional/neurological deficits10 as well as the need for lengthy postoperative rehabilitation. Sarcoma response to conventional external-beam radiation therapy (EBRT) varies with histologic subtype.12 This group of tumors requires radiation doses of 50 to 66 Gy delivered in 2 Gy per fraction to achieve local control. These doses exceed the spinal cord tolerance of 46 to 50 Gy, resulting in a high risk of radiation-induced myelopathy.13-17 Another potential option for these patients is stereotactic radiosurgery (SRS), which is increasingly being used as an effective treatment for spine lesions of varied histologies. It delivers a high biologically effective dose (BED) of radiation to treatment targets, while minimizing the amount that reaches healthy tissue. This makes SRS an appealing option for spine sarcomas. Previous reports on the use of SRS to treat spine sarcomas have found that SRS appears to control pain in up to 93.8% of symptomatic lesions,17 and provides durable tumor control in up to 87.9% of lesions, resulting in a better chance of increased OS.18 Other reports found SRS to be effective in treating primary sarcomas but not metastases.17 These findings are encouraging, but since there are few reports on this topic, this patient population remains poorly understood. Our study presents a cohort of patients treated at a single institution, under a uniform dose/fractionation scheme. The goal of this institutional analysis is to evaluate the role of SRS in primary and metastatic spinal and paraspinal sarcomas. Patients with pathologically confirmed sarcomas who received spine SRS at a single institution between June 2001 and December 2013 were retrospectively reviewed after obtaining institutional review board approval. A total of 23 patients treated to 78 vertebral levels were included. Electronic medical records of clinical exams, computed tomography (CT), and magnetic resonance imaging (MRI) were evaluated. Post-treatment pain control, neurological improvement, and radiographic tumor control were the primary endpoints of this study. Although not a primary endpoint, occurrence and progression of toxicities, including vertebral compression fractures (VCF), were also recorded. The Novalis system (Brainlab, Munich, Germany) was used for spine SRS. Patient immobilization was achieved with the aid of vacuum bags. A contrast-enhanced simulation CT scan with a slice thickness of 3 mm was performed with infrared fiducial markers (ExacTrac, BrainLAB). These images were fused with diagnostic T1- and T2-weighted MRIs in the treatment planning system to define the target volume. No expansion margin was added to the gross tumor and, thus, the gross tumor volume (GTV) was equal to the planning target volume (PTV). T2-weighted MRIs were used to delineate the spinal cord 6 mm above and 6 mm below the defined GTV. A spinal cord planning organ at risk volume was not constructed. 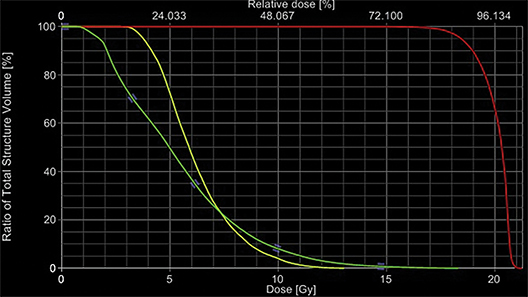 Multiple coplanar intensity-modulated radiation beams were used to optimize the radiation dose to the target volume and minimize the dose to surrounding tissue. Single doses of 10 to 20 Gy (median 18 Gy) were delivered. All doses were delivered in a single fraction and were prescribed to the 90% isodose line. The primary dose constraint for plan selection was to achieve the objective of 10 Gy to 10% of the partial volume of the spinal cord and a maximum point dose of 14 Gy. The aim for target volume coverage was to deliver 95% of the dose to 95% of the volume. However, preference was given to spinal cord dose-sparing constraints and, in cases where this was not achievable, a slight underdosage to the target volume was accepted. Prescribed dose did not vary based on tumor histology. This procedure has been detailed in previous reports.19-21 Treatment planning images are shown in Figures 1-3. A total of 23 patients and 78 treated vertebral levels were included. The average age of the cohort was 57 years (Table 1). The median radiosurgical dose was 18 Gy (range: 10 to 20 Gy) in a single fraction prescribed to the 90% isodose line (Table 2). Eleven patients had received prior radiation therapy (RT) to the spine and 10 patients underwent prior surgical resection of their tumor. Follow-up was available for 48 (62%) vertebral bodies, with a median follow-up time of 14 months. 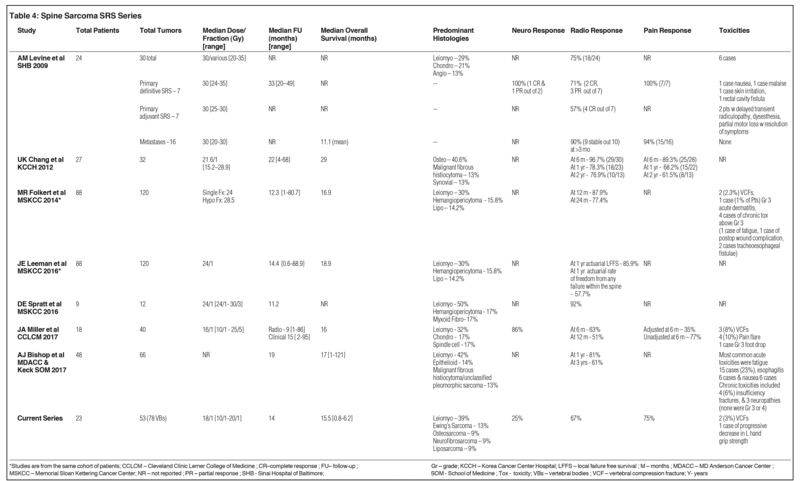 Fourteen patients were deceased, with a median survival of 15.5 months (Table 2). Leiomyosarcoma was the most common histologic subtype among the cohort with 9 patients (Table 2). The average tumor volume was 53.12 cc (range: 2.02 to 207.25 cc) (Table 2). Overall pain response was 75% (25% partial and 50% complete relief). Pain was stable in 25% of the patients, and no pain progression was observed (Table 3). Total neurological response was 67% (0% complete, 67% partial). All remaining patients were neurologically stable after treatment. In 1 patient, a new neurological deficit was observed after SRS. This patient suffered from decreased grip strength on the left after receiving SRS 16 Gy/1fx to C1-C2 and C4-C5. Total radiographic response was 67% (0% complete, 29% partial, 38% stable). 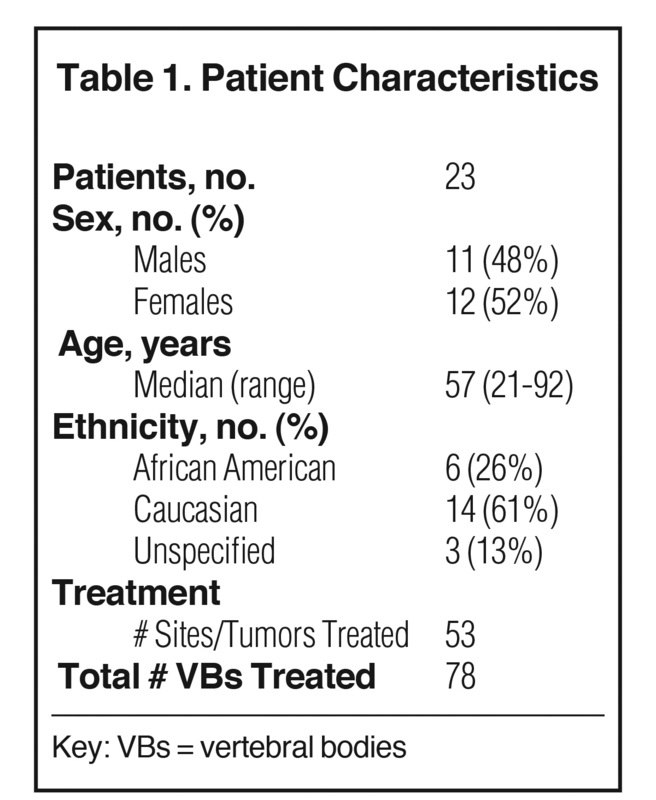 Local tumor progression was observed in 33% of the patients (Table 3). One patient initially had a partial radiographic response that progressed after 10 months. Another patient was initially stable but experienced radiographic progression after 3 months. Eight VCFs were noted, 2 of which may be attributed to SRS. No other adverse effects were observed. The standard methods of achieving LC in spine sarcomas are limited. SRS, an alternative method of achieving LC, has shown efficacy in preliminary studies, and our results corroborate this. In our study, 23 patients and 78 spinal levels were treated with SRS, resulting in fair response rates for pain relief, neurologic improvement, and radiographic tumor response. Our sample size is comparable to those of the previous published reports on spine sarcoma SRS, and when taken in conjunction with the results of the prior reports, our series allows for a better understanding of SRS treatment of spine sarcomas. LC was the only endpoint evaluated in all of the previously reported series as well as our own. Therefore, the efficacy of spine SRS in achieving LC in sarcomas is the most well understood endpoint. A report by Folkert et al found that in comparison to hypofractionated SRS, single-fraction SRS was associated with improved LC.18 Levine et al determined that in metastases, however, LC is difficult to evaluate due to the high mortality of these patients.17 The Mayo Clinic series reported on the response of spine sarcomas combined with sarcomas of other anatomical locations with an LC of 85% at 2 years for patients treated definitively/curatively. This series did not analyze local control for patients treated palliatively since these patients did not have routine imaging.22 In the series by Chang et al, young age was found predictive of favorable local progression-free survival. Their series also found a correlation between dose and LC with patients receiving above 22 Gy experiencing better LC at 2 years compared with those below 22 Gy.16 A study on sarcoma response to conventional RT such as Kepka’s found the sarcoma response rate to be 22% when < 63 Gy was delivered; however; the rates rose to 60% when doses above 63 Gy were used.13 Our institution delivered a mean surgical dose of 18 Gy and our LC was 67%. Although LC was moderate in our series, symptom control was achieved and maintained even in cases with radiographic progression, which highlights the palliative utility of SRS. Although there is reason to believe that the precision of SRS minimizes potential toxicities, they do occur in certain patients. In our series, one non-VCF toxicity was observed. A patient experienced a new neurological deficit of decreased grip strength in the left hand after EBRT of 51 Gy/17 fx to the entire cervical spine, with an SRS boost of 16 Gy/1 fx to C4-C5 2 weeks prior to the EBRT, and a boost of 16 Gy/1 fx to C1-C2 1 week after EBRT. Pertinent spine imaging was not available to evaluate the potential contribution of radiation toward this patient’s symptoms. The patient also had metastatic disease within the left radius corresponding to the time of symptom presentation. Even though this may have been the cause, the potential effects of radiation cannot be eliminated as a contributing factor to the development of the deficit. With 1 patient experiencing a non-VCF toxicity, our toxicity rate was relatively low; however, our median follow-up of 14 months may have precluded the observance of late toxicities. Complications/toxicities in the report by Levine et al include delayed transient radiculopathy and dysesthesias in 2 patients and a rectal tumor cavity fistula in 1 patient.17 In Folkert’s study at Memorial Sloan Kettering Cancer Center, complications included 1 case of grade 3 fatigue, 1 case of grade 3 postoperative wound complication, and 2 cases of grade 3 tracheoesophageal fistulae.18 In the Mayo clinic series, late toxicities occurred in 2 spine patients, 1 of which was treated to a recurrent sacral lesion and experienced grade 3 neuropathy. Prior to SRS, this patient received conventional RT (59.4 Gy/33 fx) to the same region. The other patient who experienced a toxicity in his or her cohort was treated to T11 and experienced myelodysplastic syndrome (MDS); this toxicity developed 3 years after treatment.22 It is worth noting that the primary histology in this series was Ewing’s sarcoma; this histologic subtype is typically considered to be radio-responsive, and is known to affect relatively young patients, which may be why late toxicities were observed in their cohort. In Brown’s series, most of the patients (3 out of 4) with long-term follow up had Ewing’s sarcoma demonstrating how histologic subtype likely plays an important role in the disease sequalae. Due to the varied radiation responses of the different sarcoma histologic subtypes, it is difficult to directly compare the previous studies with our own. Leiomyosarcoma was the predominant histology in our cohort, accounting for approximately 39% of the patients. There is little existing literature on the radio-responsiveness of leiomyosarcomas. The little that is known is drawn from literature on conventional RT in the treatment of leiomyosarcomas of the uterus where it most frequently occurs.12 As with other sarcomas, surgery is the recommended treatment and, when indicated, adjuvant RT. A University of Michigan institutional analysis (n = 8) reported on the intra-lesional resection of spine leiomyosarcomas in which they observed excellent clinical response rates; however, recurrence occurred in 63% of patients.27 In our series, 6 of the leiomyosarcoma tumors that were painful at presentation were evaluable for follow-up. Pain remained stable in 1 site and relief was experienced in 5 (complete – 3, partial – 2). Five of the tumors/treatment sites associated with neurological deficits at presentation were evaluable for neurological follow-up, and functioning remained stable in all 5 sites. Local control was achieved in 3 out of the 5 sites (stable – 2, partial – 1) evaluable for radiographic follow-up, and tumor progression was observed in 2 of the sites. The radiographic progressions were asymptomatic, and a complete and durable pain response was achieved in 1 of the treatment sites even though it progressed radiographically. Our response rates for leiomyosarcomas and the overall LC rate for the cohort may suggest that when en bloc surgical resection/negative margins are not possible, SRS efficacy may be similar to that of surgery. Since SRS is delivered in as little as 1 fraction, treatment time is significantly shortened, and the need for postsurgical rehabilitation is eliminated; as a result, SRS is convenient and does not interfere with concurrent chemotherapy schedules. However, given the small size of our cohort, this is speculative and larger studies are needed to better understand the treatment responses in these patients. Limitations of this study include those inherent in retrospective analyses, and our inclusion of subjective endpoints such as pain and neurological response. Despite this subjectivity, the clinical responses were observed throughout the 12 years included in this analysis, at a single institution by a single physician, resulting in increased uniformity. Another limitation is the small sample size of our cohort, which precludes us from making definitive statements on SRS efficacy for spine sarcomas. Although larger studies are needed, when our results are taken in conjunction with the previously reported series, the role of SRS in the treatment of spine sarcomas can be better understood. Additionally, our cohort had a relatively diverse representation of ethnicities. When presented with the difficulty of choosing between local control and safety, in addition to the standard treatment options, SRS should be considered. With 75% of our patients experiencing pain relief, 67% experiencing neurologic improvement, and 67% experiencing radiographic tumor control, our results suggest that SRS has a role in treating primary and metastatic sarcomas of the spine. Further studies that are larger, histology specific, and geared toward determining the optimal dose are needed to create more conclusive guidelines on treating spine sarcomas with SRS. Ozturk AK, Gokaslan ZL, Wolinsky JP. Surgical treatment of sarcomas of the spine. Current treatment options in oncology. 2014;15:482-492. Ropper AE, Cahill KS, Hanna JW, et al. Primary vertebral tumors: a review of epidemiologic, histological and imaging findings, part II: locally aggressive and malignant tumors. Neurosurgery. 2012;70(1):211-219; discussion 219. Fletcher CD. The evolving classification of soft tissue tumours - an update based on the new 2013 WHO classification. Histopathology. 2014;64(1):2-11. Shmookler B, Bickels J, Jelinek J, et al. Bone and soft-tissue sarcomas: epidemiology, radiology, pathology and fundamentals of surgical treatment. In: Malawer MM, Sugarbaker PH, eds. Musculoskeletal Cancer Surgery: Treatment of Sarcomas and Allied Diseases 1st ed. Dordrecht, Netherlands: Springer Netherlands; 2004:3-35. Talac R, Yaszemski MJ, Currier BL, et al. Relationship between surgical margins and local recurrence in sarcomas of the spine. Clinical Orthop Relat Res. 2002;397:127-132. Sundaresan N, Boriani S, Rothman A, Holtzman R. Tumors of the osseous spine. J Neurooncol. 2004;69:273-290. Bilsky MH, Boland PJ, Panageas KS, et al. Intralesional resection of primary and metastatic sarcoma involving the spine: outcome analysis of 59 patients. Neurosurg. 2001;49(6):1277-1286; discussion 86-87. Rao G, Suki D, Chakrabarti I, et al. Surgical management of primary and metastatic sarcoma of the mobile spine. J Neurosurg Spine. 2008;9(2):120-128. Sciubba DM, Okuno SH, Dekutoski MB, Gokaslan ZL. Ewing and osteogenic sarcoma: evidence for multidisciplinary management. Spine. 2009;34:S58-68. Boriani S, Saravanja D, Yamada Y, et al. Challenges of local recurrence and cure in low grade malignant tumors of the spine. Spine. 2009;34(22 Suppl):S48-57. Rhomberg W. The radiation response of sarcomas by histologic subtypes: a review with special emphasis given to results achieved with razoxane. Sarcoma. 2006;2006(1):87367. Kepka L, DeLaney TF, Suit HD, Goldberg SI. Results of radiation therapy for unresected soft-tissue sarcomas. Int J Radiat Oncol Biol Phys. 2005;63(3):852-859. DeLaney TF, Trofimov AV, Engelsman M, Suit HD. Advanced-technology radiation therapy in the management of bone and soft tissue sarcomas. Cancer Control. 2005;12(1):27-35. Guest C, Wang EH, Davis A, et al. Paraspinal soft-tissue sarcoma. Classification of 14 cases. Spine. 1993;18(10):1292-1297. Chang UK, Cho WI, Lee DH, et al. Stereotactic radiosurgery for primary and metastatic sarcomas involving the spine. J Neurooncol. 2012;107(3):551-557. Levine AM, Coleman C, Horasek S. Stereotactic radiosurgery for the treatment of primary sarcomas and sarcoma metastases of the spine. Neurosurgery. 2009;64(2 Suppl):A54-59. Folkert MR, Bilsky MH, Tom AK, et al. Outcomes and toxicity for hypofractionated and single-fraction image-guided stereotactic radiosurgery for sarcomas metastasizing to the spine. Int J Radiat Oncol Biol Phys. 2014;88(5):1085-1091. Ryu S, Fang Yin F, Rock J, et al. Image-guided and intensity-modulated radiosurgery for patients with spinal metastasis. Cancer. 2003;97(2):2013-2018. Rock JP, Ryu S, Yin FF. Novalis radiosurgery for metastatic spine tumors. Neurosurg Clin N Am. 2004;15:503-509. Boyce-Fappiano D, Elibe E, Schultz L, et al. Analysis of the factors contributing to vertebral compression fractures after spine stereotactic radiosurgery. Int J Radiat Oncol Biol Phys. 2017;97:236-245. Brown LC, Lester RA, Grams MP, et al. 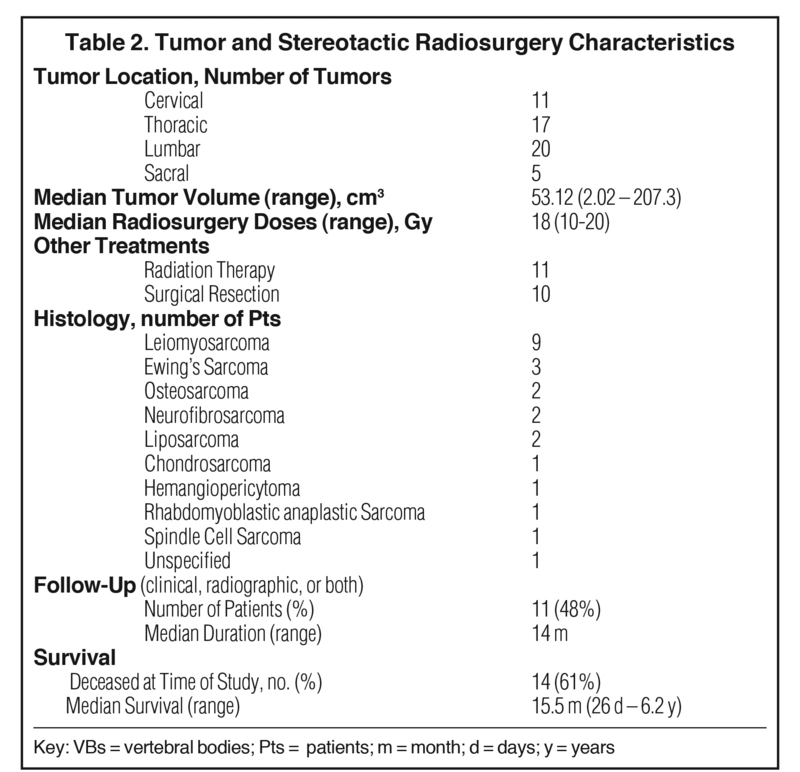 Stereotactic body radiotherapy for metastatic and recurrent ewing sarcoma and osteosarcoma. Sarcoma. 2014;2014:418270. Bishop AJ, Tao R, Guadagnolo BA, et al. Spine stereotactic radiosurgery for metastatic sarcoma: patterns of failure and radiation treatment volume considerations. J Neurosurg Spine. 2017;27(3):303-311. Leeman JE, Bilsky M, Laufer I, et al. Stereotactic body radiotherapy for metastatic spinal sarcoma: a detailed patterns-of-failure study. J Neuro Spine. 2016;25(1):52-58. Miller JA, Balagamwala EH, Angelov L, et al. Stereotactic radiosurgery for the treatment of primary and metastatic spinal sarcomas. Technol Cancer Res Treat. 2017;16(3):276-784. Spratt DE, Arevalo-Perez J, Leeman JE, et al. Early magnetic resonance imaging biomarkers to predict local control after high dose stereotactic body radiotherapy for patients with sarcoma spine metastases. Spine J. 2016;16(3):291-298. Ziewacz JE, Lau D, La Marca F, Park P. Outcomes after surgery for spinal metastatic leiomyosarcoma. J Neuro Spine. 2012;17(5):432-437. Disclosure: Dr. M. Salim Siddiqui, Dr. Ning Wen, and Dr. Farzan Siddiqui are employed by the Henry Ford Hospital Department of Radiation Oncology, which receives research funding from Philips Healthcare, Andover, MA, and Varian, Palo Alto, CA, (SRS Education and Research Grant, Grant Number - M60287). The funding sources had no direct involvement with the content or analysis of the material in this manuscript. Dr. Ian Lee serves as a consultant for Medtronic, Minneapolis, MN, and has received a speaker honorarium from Varian. For the remaining authors, no conflicts were declared. An abstract of a variation this paper was presented as a poster at the American Society for Therapeutic Radiation Oncology 57th Annual Meeting in San Antonio, TX, October 18-21, 2015. The abstract was published in the conference proceedings (Boyce-Fappiano D, Elibe E, Ryu S, Siddiqui MSU, Wen N, Lee I, et al: Stereotactic Radiosurgery for Primary and Metastatic Sarcomas of the Spine. Int J Radiat Oncol Biol Phys. 2015). Elibe E, Boyce-Fappiano D, RyuS, Siddiqui S, Lee I, Rock J, Siddiqui F. Stereotactic radiosurgery for primary and metastatic sarcomas of the spine. Appl Rad Oncol. 2018;7(1):24-32. Ms. Elibe is a student, and Mr. Boyce-Fappiano was a student at the time of article submission. Dr. Ryu is chair, professor and deputy director, Cancer Center Clinical Affairs, Department of Radiation Oncology, Stony Brook University School of Medicine, Stony Brook, NY. Dr. M. Salim Siddiqui is director, brain and spine radiation oncology, Department of Radiation Oncology, Henry Ford Hospital, Detroit, MI. Dr. Lee is a staff physician, Department of Neurosurgery, Henry Ford Hospital. Dr. Rock is residency program director, neurological surgery, Department of Neurosurgery, Henry Ford Hospital. Dr. Farzan Siddiqui is vice chair; director, head and neck radiation oncology, Department of Radiation Oncology, Henry Ford Hospital.